Americans don’t drive as much as they used to. The Department of Transportation estimates that Americans drove 2.9 trillion miles in the year from April 2011 to March 2012. That’s still a lot of vehicle miles—more than 9,300 miles per person. But that number is down about 3% from its peak at the end of 2007. The timing of the peak is no coincidence. As the economics blog Calculated Risk explains, The number of miles Americans drive fell sharply with the beginning of the recession in 2008, as we began both to travel less and to transport fewer goods. 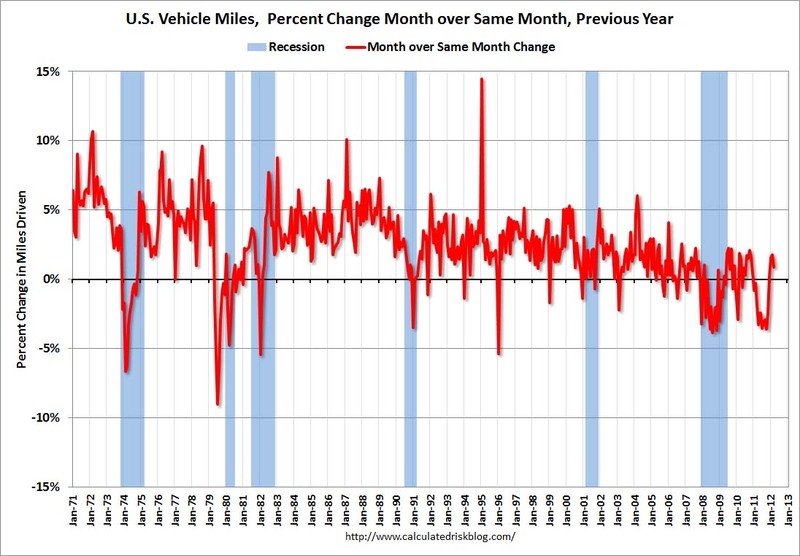 In fact, recessions have been just about the only things that have ever reduced the number of miles we drive. Rising oil prices are the other major reason that Americans drive less. The other major drops in the number of miles Americans drive coincided with the recessions in 1974 and the early 1980s. Those recessions, of course, were each caused in part by a sharp rise in the real price of oil. The 1974 recession was connected with the 1973 OPEC oil embargo and the recessions in the early 1980s were connected with the Iranian revolution and Iran-Iraq war. The most recent recession was also triggered in part by oil prices, which hit an all-time high in the middle of 2008 before Bush left office. What’s surprising is not that Americans drove less as oil prices rose and the economy shrank, but that they still haven’t really started driving more again. 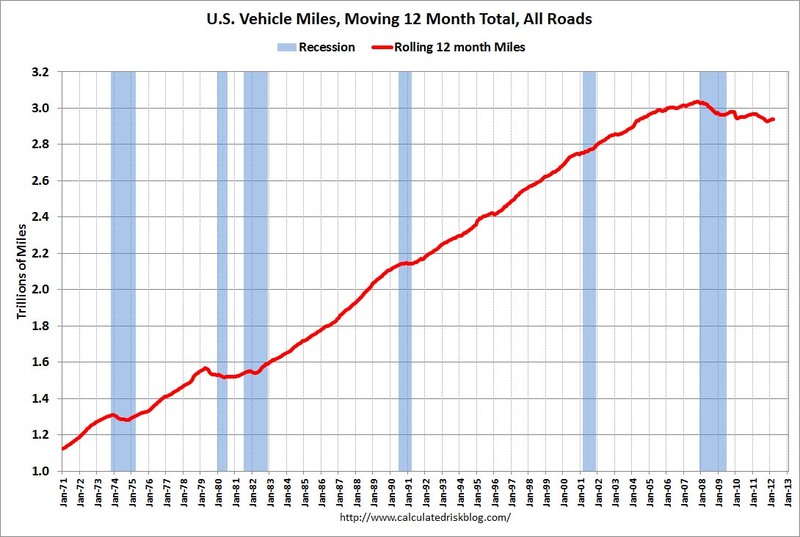 Even though Americans have driven slightly more in recent months, the number of miles we’ve driven has generally continued to decline since the official end of the recession—in sharp contrast to its steady rise for most of the rest of last forty years. That probably has something to do with the weakness of the recovery, although the economy has been actually averaging 2.3% annual growth since the end of 2009. It probably also has something to do with oil prices, which have been on the rise again since falling sharply as world output shrank in 2009. But there may be more to it. We may also be driving less because we’re getting older. As Calculated Risk points out, Census Bureau data show that Americans consume steadily less gas after their late 40s. That's probably largely because as they age they drive less. Now that Baby Boomers are all over 50, they are likely to drive less and less. That may be why the growth in the number of miles Americans drive actually began to slow well before the latest recession. It’s not likely to have much effect on gas prices, which are driven to a much larger extent by rising demand in the developing world. But it is good news for our already overtaxed infrastructure, and it should make the U.S. less a little less vulnerable to future spikes in oil prices.